In February, Royal Wolf provided a simple, smart solution for the Canberra International Tennis Centre, which needed to create a special ‘Hawkeye room’ ahead of its televised women’s Federation Cup match between Australia and Ukraine. The ‘Hawkeye’ is an essential part of the game – monitoring the match from several angles to allow accurate instant replay. 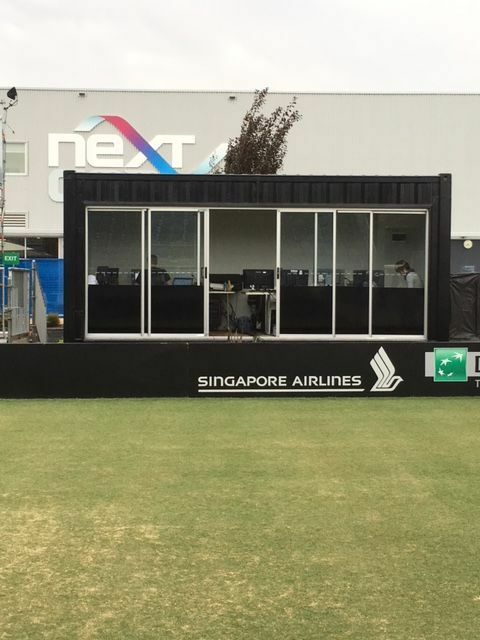 Unlike many venues, the Canberra International Tennis Centre doesn’t have an existing space dedicated for a Hawkeye room – so when they prepared for the big game, they turned to Royal Wolf to come up with an out-of-the-box solution. Linton Snowden, ACT Sales Manager, said that after looking at the site it was clear that Royal Wolf already had the perfect option ready to go with their 20ft ‘Outdoor Room’ container. 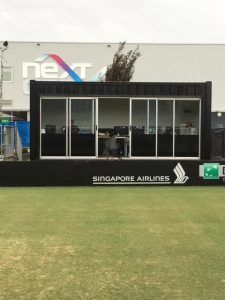 “There were a number of particular requirements for the set-up of the space, which our Outdoor Room product was ideal for, coming fully equipped with two high-strength bi-folding security doors that cover the glass sliding screens, so the crew could have full view of the court while remaining inside to watch the monitors,” said Linton. “The 3.4kw reverse cycle air conditioner also allowed for the temperature to remain cool and consistent to ensure the computer equipment didn’t overheat, while the in-built power outlets and 15 amp power connection point were essential to keep the equipment running without external assistance,” he said. The biggest challenge was getting the container into the stadium. With no access point big enough to accommodate the box, it was lowered in by a crane, to allow the event organisers to build the Grandstand scaffolding around it. “The other benefit of the Outdoor Room was its convenience. We had two days to turnaround the installation, so having a range of innovative solutions ready-to-go ensured we were able to service the client quickly and efficiently without the need to build a specialty product from scratch,” said Linton. Australia was victorious in Round I, sending them into the World Group play-offs for the first time since 2015. The Canberra International Tennis Centre are looking forward working with Royal Wolf again when Australia plays Round II later this year.